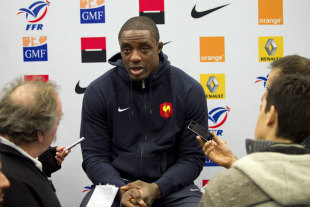 France have called Yannick Nyanga into the squad to play Australia on Saturday, with the flanker replacing Toulouse team-mate Yacouba Camara as the only change to the group ahead of the Test at Stade de France on Saturday. "Yacouba Camara is a young player with huge potential," France coach Philippe Saint-Andre said of his decision. "But Yannick Nyanga has had great performances with Toulouse, he has lived and has experience at the highest level, and we also know his mindset." Camara, 20, was among the 30-man training squad ahead of the Test against Fiji, but he is still waiting to win his first cap after being left off the starting list for their 40-15 victory in Marseille on Saturday. Nyanga, 30, has 39 caps, but missed the build-up to the Fiji Test as he recovered from a groin injury, although he played for Toulouse in the Top 14 win over Bordeaux-Begles on Saturday. Forwards: Xavier Chiocci (Toulon), Alexandre Menini (Toulon), Benjamin Kayser (Clermont), Guilhem Guirado (Toulon), Nicolas Mas (Montpellier), Uini Atonio (La Rochelle), Alexandre Flanquart (Stade Francais), Yoann Maestri (Toulouse), Pascal Pap (Stade Francais), Sebastien Vahaamahina (Clermont), Damien Chouly (Clermont), Thierry Dusautoir (Toulouse), Bernard Le Roux (Racing-Metro), Virgile Bruni (Toulon), Charles Ollivon (Bayonne), Yannick Nyanga (Toulouse). Backs: Rory Kockott (Castres), Sebastien Tillous-Borde (Toulon), Remi Tales (Castres), Camille Lopez (Clermont), Pierre Bernard (Bordeaux-Begles), Mathieu Bastareaud (Toulon), Wesley Fofana (Stade Francais), Maxime Mermoz (Toulon), Alexandre Dumoulin (Racing-Metro), Teddy Thomas (Racing-Metro), Maxime Medard (Toulouse), Benjamin Fall (Montpellier), Scott Spedding (Bayonne), Yoann Huget (Toulouse).